On Thursday, October 11th, the culprit’s Senior Counsel once again chose not to appear in a court of law, interfering and influencing the judiciary while deliberately preventing positive action by those fighting for Ganga’s most basic rights. Deliberate delays employed by the culprits, and the collusion between them and the Government, are highly corrupt. It’s appalling that almost without fail it takes many years of consistently fighting the system to get any elephant moved to humane conditions. We ask for your calm and steadfast presence. To support a worthwhile cause with sincerity, to the end, is no easy feat, but we will all continue for what is just. No matter how disheartening this long journey has been, surely Ganga’s suffering is worth staying the course until she is no longer seen as “Fraudulent Permit #198”, but rather a sentient being who deserves far more than she has ever been given. Today’s Court Proceedings: The counsel of Ganga’s illegal captors once again asked for, and received, a postponement of the case. In a packed, overflowing court with rooms chaotically shifted to accommodate other cases, much time was wasted as the typical game of “cat and mouse” was played in the ongoing attempt to draw out the proceedings for as long as possible. Her captors continue to buy time, allowing for the sustained use of illegally-captured Ganga in upcoming peraheras. Legal Counsel will share the next step for Ganga when it is in Ganga’s best interests to be made public. Please understand this is a very sensitive case, and some things must be kept off of social media until the time is right. Thank you for your ongoing support as together we remain steadfast in creating a kinder world for us all. Preparing for Ganga’s day in court, we’ve arrived back in Sri Lanka. And this is where we found her…These are the conditions Ganga is currently forced to endure: chained up all alone in the back of an empty lot off a busy street, living on broken cement surrounded by rubbish. 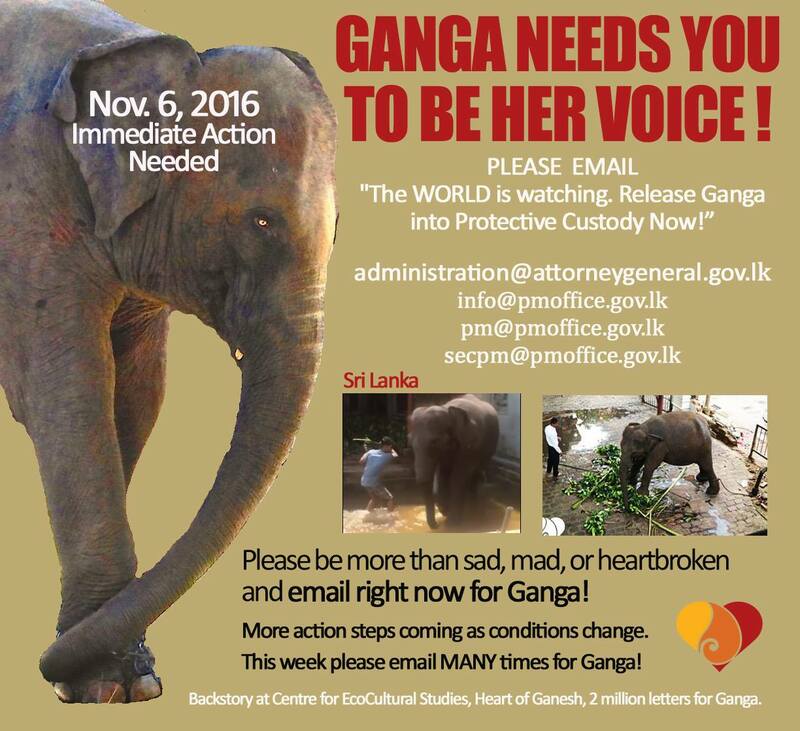 The government of Sri Lanka is deliberately delaying justice for Ganga, refusing to take her into the protective custody of the DWC (Department of Wildlife Conservation). The order was given for her to be taken into Protected Custody in February of 2016, yet corrupted parties continue to delay her court case and thus her rehabilitation. Her next court date is now set for July 12th, and we’ll be there. Even if you have already, please continue to submit your grievances to the President and email the Foreign Ministry, so that Ganga may one day live in peace among others of her own kind, to heal her past, and to have a future without pain, fear, and loneliness. Legal Counsel for young Ganga claimed the most positive outcome since the lower court order of 2015 (yes, remaining steadfast to the cause since 2015! ), with this formal report: “The next court date was fixed for Friday, July 6th, to support the case. CES will support the evidence to prove that baby Ganga is wild caught and thereby illegally captive held”. By now, supporters of Ganga and followers of her case surely realize that political moves can be/are highly corrupt, and to support a worthwhile cause with sincerity, to the end, is no easy feat. Please continue to submit your grievances to the President as written in the post below! Support Legal Counsel who has refused to back down no matter the cost, so that Ganga, and so many like her, may one day live in peace among others of her own kind, to heal her past, and to have a future without pain, fear, and loneliness. No matter how disheartening this extended battle has been, surely Ganga’s suffering is worth staying the course until she is no longer seen as “Fraudulent Permit #198”, but rather a living, feeling being who deserves far more than she has even been given. Note: some emails have randomly popped back with an invalid security certificate notice, while many, many hundreds more have gone through —please don’t give up, and try on another device if yours pops back. We’ve been asked to keep the pressure up during this time, so even if you have already written, please write again. Outrage alone is futile. Action is Everything. The Long Fight for Ganga’s previously court-ordered release into Protective Custody continues to be openly and flagrantly defied. 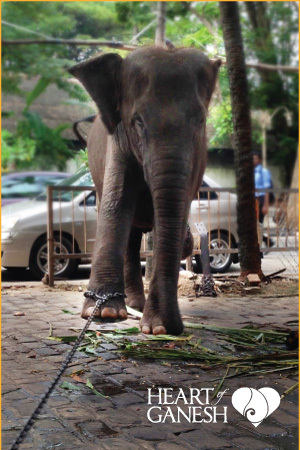 The cruelty of her solitary life in chains is relentless as her keepers exploit her in the name of religion and social status in a blatant display of political maneuvering. Just as grievous is with her court case backed up to March 2018, Ganga’s illegal owners will use her in the Navam Perahera at the end of February, the same perahera that paraded her consecutively in 2016 and 2017 despite the long standing court order for her to be taken into the protective custody of the State. 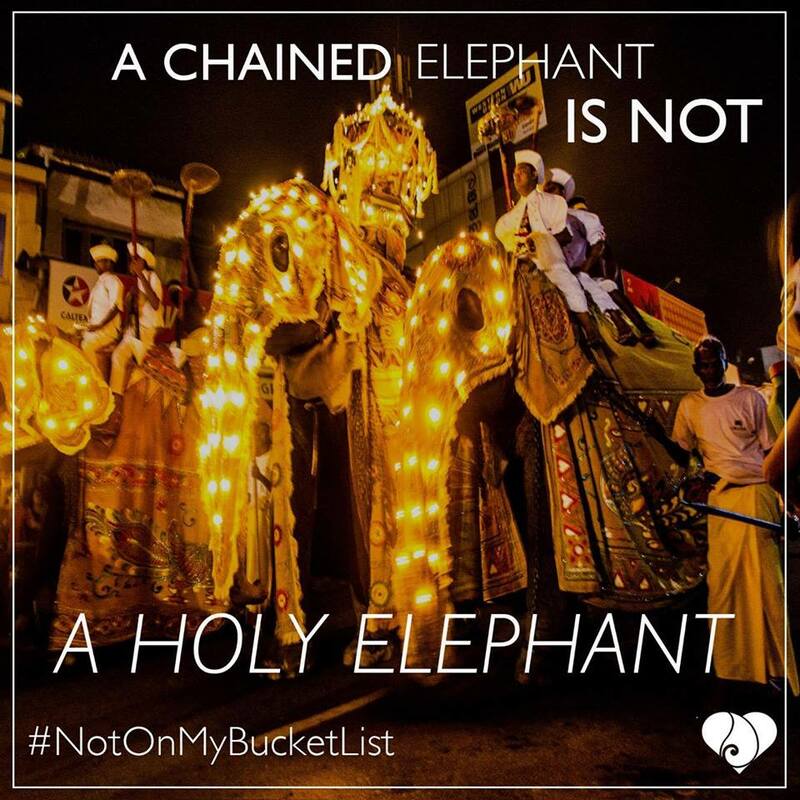 Even if you have written during our past campaigns, please write again over the next couple of weeks before the perahera as well as ahead of her March court date, letting the President know that you will not support cruelty with your tourist dollar. Thank you to everyone who has remained steadfast in the fight for what is right. No matter how disheartening this has been, surely Ganga’s suffering is worth staying the course until she is no longer seen as “Fraudulent Permit #198”, but rather a living, feeling being who deserves far more than she has even been given. We are angered and deeply saddened to report that court proceedings were shrewdly and deliberately delayed by Ganga’s captors, preventing positive action by those fighting for her basic and humane rights. Just as grievous is with her case backed up to March 2018, Ganga’s illegal owners will use her in the Navam Perahera this February, the same perahera that has used her consecutively in 2016 and 2017 despite the long standing court order for her to be taken into the protective custody of the State. Court injustice has once again allowed all manner of wildlife crime to intensify in Sri Lanka! Please, if you are a visitor to beautiful Sri Lanka this February, do not support such cruelty with your tourist dollar. As legal counsel from CES continue working ceaselessly against the multi-layered corruption keeping Ganga, and many other innocent sentient beings imprisoned, we remain steadfast in our support of their team. Ongoing work has become dramatically more challenging as systemic corruption and invasive manipulation of court proceedings continue unabated. No matter how disheartening this has been, surely Ganga’s suffering is worth staying the course until she is no longer seen as “Fraudulent Permit #198”, but rather a living, feeling being who deserves far more than she has even been given. THE COURT ORDER for Ganga’s release into safe custody from illegal captivity by religious institutions has been openly and flagrantly defied for well over a year. The ruling in favor of moving Ganga into Protective Custody has repeatedly been ignored as her keepers not only deny her compassionate care, but also continue to exploit her in the name of religion and social status in a blatant display of political maneuvering. NEXT COURT DATE: Ganga’s case heads to Supreme Court, Colombo, Sri Lanka on Monday, December 11th, at 10:00 AM. Even if you have written to the above people during our past campaigns, please write again (and again and again)over the next couple of weeks. Local supporters are invited to fill the court room in support of what is right in this long fight. At great cost in all ways, the Legal Counsel from the Centre for EcoCultural Studies continue to intervene in court on Ganga’s behalf as the depth of governmental corruption continues to be revealed. Ongoing work has become dramatically more challenging as systemic corruption and invasive manipulation of court proceedings continues unabated. Someone asked me why everyone is “doing all that work for just one elephant”. Yes she is one. 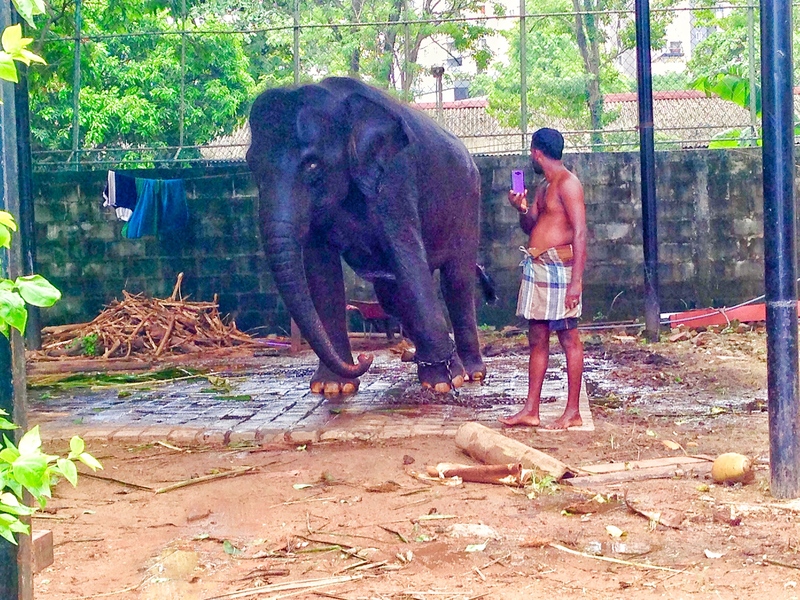 One of many hundreds of Temple Elephants, all who need protection from the ways of abject cruelty. She is an innocent sentient being, worthy of kindness for no other reason than that. But if more reasons are necessary, then we see how changing the Story of One can change the Story of Many. Outrage alone is futile. Action is Everything. COURT DATE: Ganga’s case is slated to be heard in court, again, in Colombo, Sri Lanka on DECEMBER 11th. THE COURT ORDER for Ganga’s release into safe custody from illegal captivity by religious institutions has been openly and flagrantly defied for OVER A YEAR. LEGAL COUNSEL’S ROLE, to ensure that Ganga’s previously-issued Court Order is honored, has been/will be met with tremendous challenges and fierce opposition as this long battle for what is right continues on. Updates and time of court appearance will be posted when available. We are deeply saddened that the formally-rescued juvenile elephants in the protective custody of the DWC have been returned to their captors. 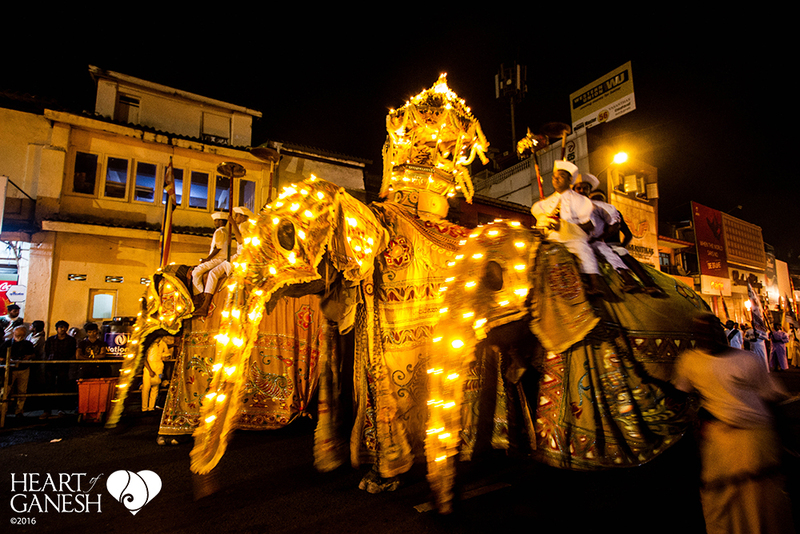 Although it is said to be temporary, most likely for 15 days within the Kandy Perahera, what then? No answers are forthcoming at this time. Just as grievous is the information that it appears Ganga will also be used in the perahera this August. Once again court documents were deliberately delayed to prevent counter action by the legal counsel fighting for the rights of Ganga, and for all of the illegally-held juvenile elephants. Court injustice has allowed wildlife crime to intensify, a major setback in Sri Lanka for the illegally captured young elephants in DWC custody. The court battle must continue until natural justice is met on behalf of Sri Lanka’s wildlife! We stand in support of the relentless work being sustained by stakeholders and legal counsel from CES—truly a voice of reason and compassion in the midst of appalling injustice. As the fight for what’s right continues in court, please, if you are a visitor to beautiful Sri Lanka this August, please do not support such cruelty with your tourist dollar. Check out this long but clear article if you would like to learn more about the tragic stage that has now been set for a State sponsored trade in wild baby elephants. CES has asked us to post a short update stating the FR case (Fundamental Rights) filed by Ganga’s illegal captors continues to defy the Court Order for her release. As the temple pageants continue unabated and additional elephants are being pulled in for the upcoming peraheras, the battle ahead will be costly, lengthy, and more complex and convoluted than any could have imagined. Over a year now since the original court order was issued in Magistrate Court, and State authorities continue to refuse enforcement of the order, with those who were entrusted to carry out orders on her behalf buckling under internal pressure. As her case moves through the convoluted layers of the legal system, multiple international campaigns have been run in a show of support for legal counsel, with thousands of emails flooding the Attorney General’s Department, the Department of Wildlife Conservation, the Tourist Authority, the Ministry of Buddha Sasana, and to those illegally holding her in captivity. “CES was represented in Supreme Court today as pledged on behalf of baby Ganga in the case filed by her illegal captors,with minimal support for her welfare on the part of the State representative, sad to say! Court documents have yet to be filed by the Petitioner (illegal captor) despite the prolonged delay and despite the case having been filed over the 3+ months ago. It’s hard to believe that it was LAST February (2016) that Ganga’s case had a COURT ORDER for her to be moved into Protective Custody, and that over a year later the fight continues with those who were entrusted to carry out orders on her behalf having buckled under internal pressure. Heart of Ganesh and 2 Million Letters for Ganga continue our Full Support of the loyal and relentless Legal Team from the Centre for Eco-Cultural Studies. Please continue to write the President of Sri Lanka, respectfully asking him to allow Ganga to be taken into Protective Custody. More action-steps will be forthcoming and your support will be needed and gratefully received. On January 18th, 2017 we were informed by the legal counsel of CES, the in-country voice in the fight for Ganga, of forthcoming legal proceedings. Ganga’s case in the High Court of Sri Lanka is now scheduled for late February, almost a year after the original court order was issued in Magistrate Court, with State authorities continuing to refuse to enforce the order. At great cost in all ways, the Centre for EcoCultural Studies continue to intervene in court on Ganga’s behalf as the depth of governmental corruption continues to be revealed. Ongoing work has become dramatically more challenging as systemic corruption and invasive manipulation of court proceedings continues unabated. What you can do: Submit your grievance to the President of Sri Lanka. VERY IMPORTANT: PLEASE, with a direct plea from legal counsel and those working on the front lines of this case, PLEASE BE CIVIL in stating your grievance. For your message not to be filtered out and actually reach those in command, your statement must be a clear and respectful request that Ganga be taken into Protective Custody. No matter how angry, appalled, heartbroken, or infuriated you may be, for your message to make it to the proper channels, it must be a calm, clear, civil request for Ganga’s release into Protective Custody. As many of you know, Ganga’s case was back in Colombo Magistrate Court on December 9th, and again in the Court of Appeal on December 15th. There was a tremendous divide in court, biased AGAINST those fighting for her humane treatment, and in support of the corrupted representatives who seek to keep her hidden and in chains. Both parties have been called upon to submit additional actions on January 25th, with her case scheduled to be heard again thereafter. We have been called on to keep up the pressure on the Ministry of Justice and Buddha Sasana, the very culprits who are defying court action. Please click http://www.mbra.gov.lk/en/contact-us and send the clear message that Compassionate Action must be taken for Ganga immediately. Send your own message or cut/paste the one below. If you already emailed them, please do so again. The fight has been long for us all, but not nearly as long as it’s been for Ganga. Subject: Release Ganga into Protective Custody! Message: Compassionate people around the world are appalled that this innocent elephant has been kept, chained and alone for years, in the name of religion and culture. The fight for what’s right continues. Please do not think your voice won’t matter simply because this fight has been one long and agonizing rollercoaster. Around the world last week, long-term advocates for Ganga were appalled by the complete reversal of the Court Order issued February 2016, which was set to ensure her safety and wellbeing in Protective Custody. Today, legal counsel has begun preparing her case for the Supreme Court. While CES fights for what’s right in that High Court of Law, we must unite in the Common Court of Compassion. Please don’t turn away. Please don’t table it for when you have more time. Your email can be as simple as: “The WORLD is watching. 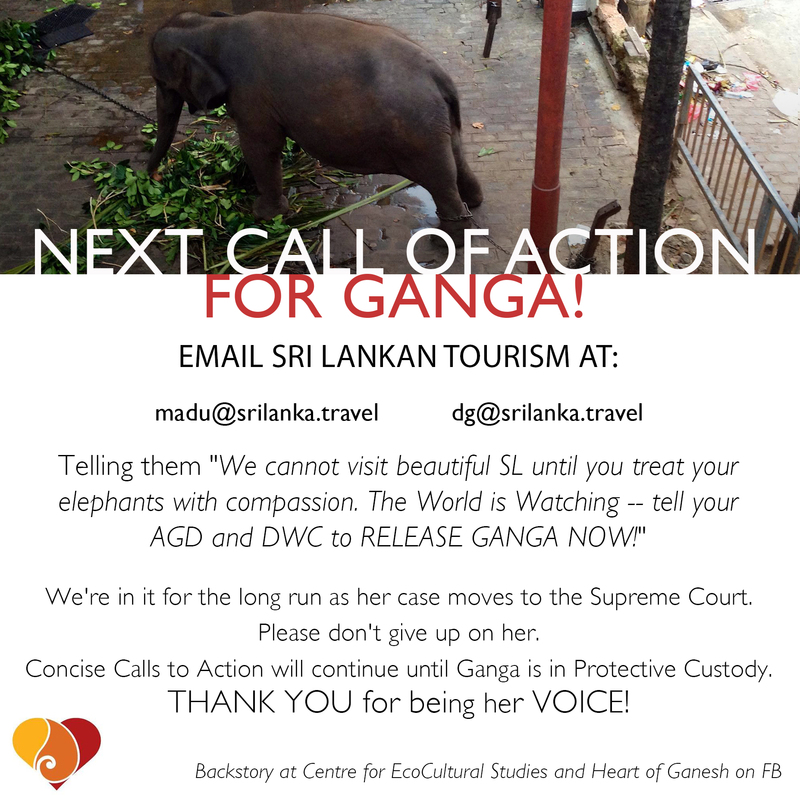 Release Ganga into Protective Custody Now!”A steady stream of daily emails will let them know we are holding them accountable, and that the future of Sri Lanka’s tourism and respect depends upon their capacity to heed the call and release Ganga into Protective Custody. ***PLEASE CALL the Director General of the Department of Wildlife with the same message you emailed to the AGD. A few quick calls can deliver your message directly to the people who must hear it. They need to hear from potential travelers and tourists to Sri Lanka, PLEASE CALL by dialing #0094-71-4465433.
call the DWC Hotline at +94 112 888585. ***Please do not think your voice won’t matter simply because this fight has been one long and agonizing rollercoaster. No matter how disheartening this has been, surely Ganga’s suffering is worth staying the course until she is no longer seen as “Fraudulent Permit #198”, but rather a living, feeling being who deserves far more than she has even been given. Yet another crushing blow in the long fight for Ganga. Absolutely unbelievable… Today the Court REVERSED their OWN mandate made over 9 months ago to release Ganga from her ILLEGAL permit holder. Illegally captured with a fraudulent permit, and with habitually ignored Court-Ordered mandates, Ganga is nothing to them but a pawn in an extensive game of corruption. International outrage, international action, and all of it reversed in an instant. Yet another crushing blow, yes, but not crushing enough for the fight to cease. We continue to stand behind the legal counsel and the brave and steadfast people of CES who have fought for Ganga day in and day out, no matter what was said or what was done. Their resiliency in the face of the Court’s outrageous decision today is one borne of knowing somehow, someway, the truth will prevail. OVER 8 MONTHS AGO, the Colombo Court Magistrate #1 ordered Ganga to be taken into immediate Protective Custody. This, and the next order, went utterly unheeded. The legal counsel of CES kept up the pressure for months until Ganga’s FRADULENT Permit #198 was back in court. ONCE AGAIN the Court ordered Ganga (and Banhu) to be taken into Protective Custody — Banhu was moved, Ganga remains a prisoner. COUNTER MOTION: On October 13th, CES filed a counter motion for the Court Order to be carried out by the Criminal Investigative Department, filing against the motion by Ganga’s illegal captors to prevent the original Order from being carried out. CORRUPT INFLUENCES: A mighty debate ensued, with CES Legal Counsel addressing the need for immediately carrying out the earlier Court Order, which was deliberately delayed by corrupt influences. NOT ONE OF US WILL BACK DOWN, not one — the fight will continue until the Court Order is carried out. CES AND LEGAL COUNSEL will update when the next step can be taken in the relentless fight ensure court justice for Ganga. Bhanu has now been taken into protective custody. Huge step in right direction! Ganga…The Court Order for her to be taken into protective custody by October 8th has not yet been fulfilled, with less than 24 hours until the deadline. 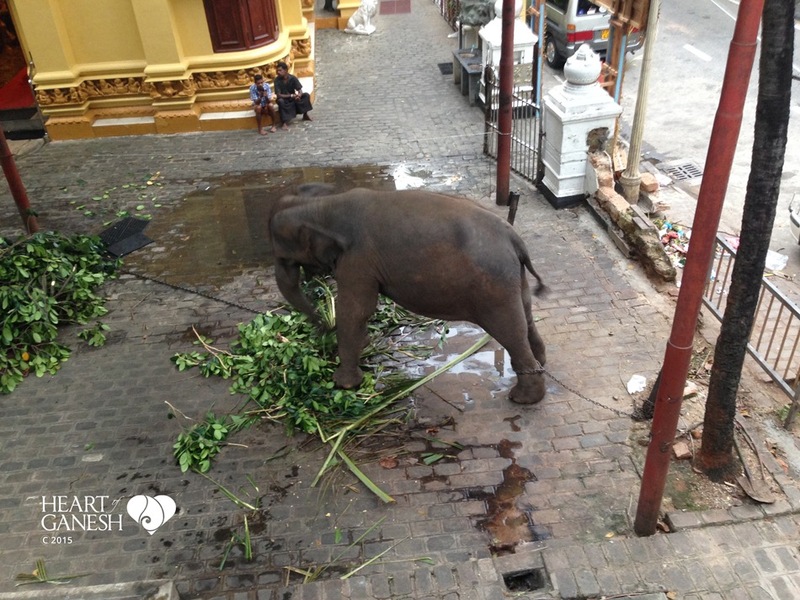 On September 8th, 2016, the Colombo Magistrate Court ordered juvenile elephants Ganga and Banhu to be taken into Protective Custody within 30 days— those 30 days are almost up, and all eyes are on the whereabouts of 2 innocent elephants. This mandate came after the February 1st, 2016 Court Order to secure custody of Ganga went utterly unheeded. Now the authorities have 3 days remaining to fulfill the action required and ensure the safe transition of young Ganga and baby Banhu. The complex and logistically challenging fight for Ganga has continued month after month without ceasing. Not one of us could have imagined the ongoing expense, the longterm commitment, and the numbing heartache that would accompany every step. Although Ganga is one of many, every success that can be won in court multiples the chances of success for all the others yet to come. Years of small steps just turned in to a step in the right direction for Ganga with a small, yet important win in court today. The legal counsel of CES stayed the course and refused to back down, stressing the violation of the previous Court Order. Their tenacious and detailed fight for what’s right convinced the Magistrate Court #1 to order Ganga and Banhu be taken into Protective Custody before their next court date of October 13th. Details to be sorted and shared by the CES team as soon as possible. Many more steps to be taken with no doubt continuing twists and turns, but even a small win is helpful in the long fight for Ganga. Thank you to One Green Planet for publishing our article. Ganga’s illegal permit #198 has, finally, been formally addressed in court. The Criminal Investigation Department has taken the order from Colombo Magistrate Court #1 for Ganga and 12 suspected illegally-captured young elephants to be placed into the protective custody of the Department of Wildlife. Ganga, along with the additional 12 innocent baby elephants, is to be immediately transferred to safety and placed under the compassionate care of veterinarians and experienced caregivers. As the hectic pieces for securing custody of Ganga were coming together yesterday, I walked past a gigantic installment of street art that said “Face It and Rise Up”. When this long fight seemed impossible, when the naysayers tried to drown out those who chose to believe, when falling down and staying down occasionally seemed like it might be the smarter thing to do, today’s positive action for Ganga is occurring thanks to many people in Sri Lanka who graciously and consistently chose to Face It and Rise Up. 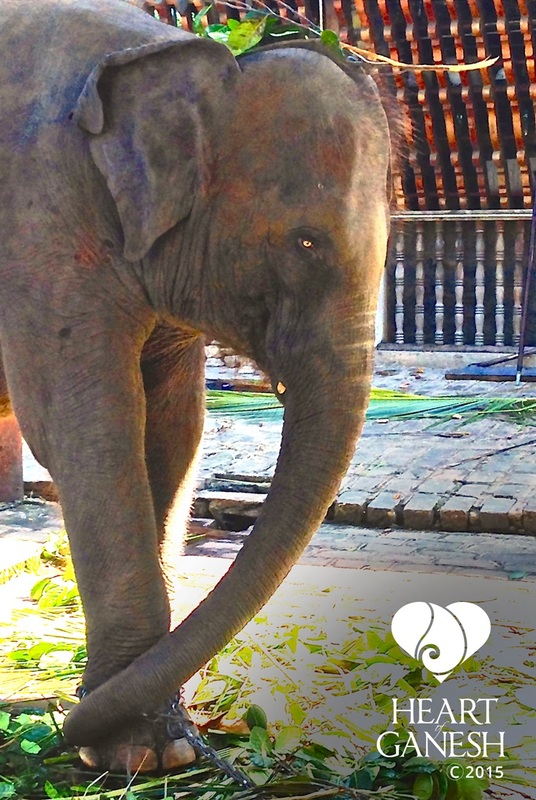 Stay tuned, nourish great hope and patient presence, and may the Court Order give Ganga the new life she deserves as soon as possible. *10 months later, and as you can tell by the posts above, the courts did NOT follow through , and the long fight for what’s right continues on. We will continue to fight for what’s right for Ganga, as her case now moves into higher courts of law, no matter how long it takes. “2 Million Letters for Ganga” is not a fundraising campaign, and not “the” answer to change. It’s not even just about Ganga! Instead, we reach out and initiate open-minded, non-combative conversations concerning the basic rights and humane treatment for all captive elephants. Together with volunteers around the world, we get people talking, thinking, and then taking action for what is possible when we take a stand for what’s right. Ultimately it’s the judicial system that will alter the path of care for captive elephants, but that system is made up of individuals — individuals who have a voice. Will you add yours? Here’s How it Works–It’s Simple! Click here for examples and guidelines, then handwrite your short, personal letter. Sign your letter and where you’re from. Take a clear close-up photo of your entire letter, making sure your signature is clear. Post your letter on Facebook at “2MillionLettersForGanga”, or send it to us at Sundari@HeartofGanesh.org and we’ll happily post it for you! 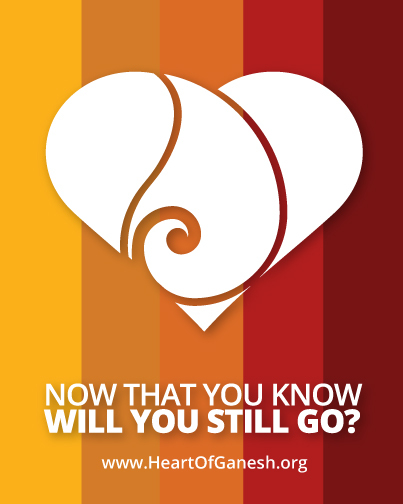 Big or small, a casual get together or a full-on event, let’s get writing for compassion! Click the link above for support in spreading the word, (and there’s a coloring sheet for kids who aren’t writing yet too). Imagine being confined so severely that you cannot turn around, cannot eat or drink when you need to, unable to move off of the urine-soaked bricks you’re shackled upon, and with no companionship to ever bring comfort. What you imagined is the life Ganga endures, with no relief in sight. She is left to rock and sway for hours, days, and years on end, trying her best to ease the desolation of her solitary confinement, while the devout and tourists alike walk past her in their search for the sacred. As we raise awareness for one, we will raise awareness for them all. Once we start changing the conversation, we can start changing the reality–and not only for Ganga and Temple elephants, but for all animals in captivity. When the voices of Compassionate Action become more prominent than the voices of dissent, we will have created a world where Compassion Trumps Captivity. And not just for Ganga, but for them all, and truly, for each one of us as well. 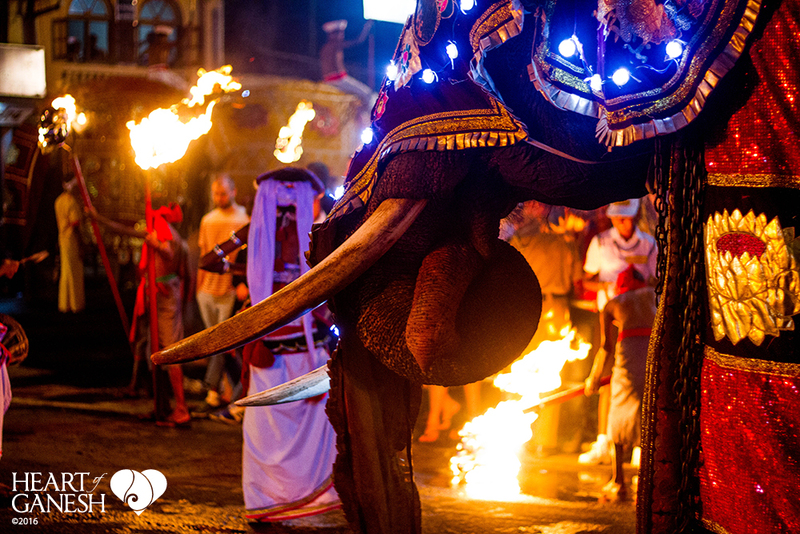 Our ultimate goal is that no elephant be held captive in temples, circuses, or within any other inhumane conditions. 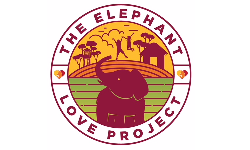 As much as we wish this could happen overnight, wishing won’t make it so, and there are many pieces of the historical, cultural, financial, and political puzzles that have to be put into place, along with many sanctuaries and refuges needing to be built, until the many elephants in need are unchained for good. Until such sweeping changes can be made, we ask for immediate compassionate care via the Five Freedoms for Animals in Captivity. Ganga, like so many other Temple Elephants, is wholly revered in myth but poorly cared for in reality. We’re working in Sri Lanka to change this, starting with Ganga. No animal, anywhere, should be confined in chains. Elephants are complex, familial, sentient beings, and the chains that bind them are simply a crime. Ganga, the Temple Elephant who inspired the creation of Heart of Ganesh. The legal fight for her right to the Five Freedoms continues. Tuk Tuks are tiny but mighty, but sometimes they decide to stop before we’re at our destination! We do our best to “go with the flow”, using the unexpected stops as refreshing breaks :-). Temple elephants suffering through another chaotic procession.